We all have been hearing that home prices have been slipping all over the nation in recent months. How bad is it? Based on a Yahoo Finance article that graphically illustrates the performance of housing prices from 1992 to 2007 in 20 US cities, the rates of decline appear to register a slowdown based on historical year-over-year monthly percent changes in home prices for the last 15 years. As was pointed out by one of our astute readers, this just means that price appreciation has slowed down significantly from the previous years and absolute prices across the nation are flattening or showing a modest decline. That doesn’t shock me at all with all the hype I’d heard about these areas in recent years. During the dot com frenzy, I had a co-worker in 2000 who was heavily into real estate rental projects and even some speculation. Before long, the frenzy turned into a bust and we were aware of lay offs in the horizon. My colleague had his act together when it came to ensuring that he had an alternative income and financial options in case the startup we worked at folded. The startup did, but he went on to pursue real estate development interests in Arizona and I’d guess Nevada as well. He even solicited colleagues at work for passive investment opportunities, enticing us to participate in these hot and growing real estate markets. He sent me brochures and information on new developments in Arizona, particularly in satellite areas near Phoenix like Gilbert, Tempe and even Glendale. I marveled at the thought of being a remote landlord and getting my toes in the water of something more novel and exotic than my usual staid mutual fund investments. But in the end, I was too chicken to try this new venture. As 2005 hit, I looked back at this “missed” opportunity with some regret. Today, I’m just relieved I decided otherwise. my regret isn’t as great as it once was. If you haven’t purchased a home yet, you could be a bit more relieved to see what’s coming up. Brace yourself for a little bit of pain because in the next year, 3% to 5% is expected to be shaved off these markets. The buzz around the real estate set is that another year or two and we should have some real buying opportunities in our midst. But in my opinion, if you’re at all in the market to buy a primary residence, these are price points worth considering. Real state is a controversial topic. 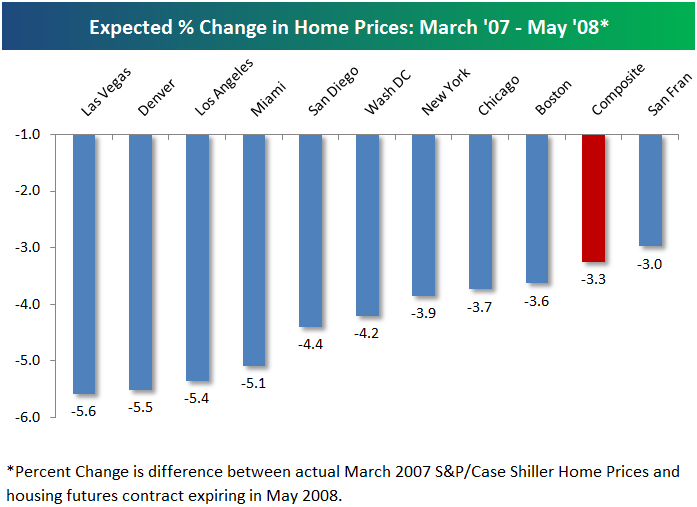 Home Prices in my particular area haven’t gone down that much. It’s an area for young professionals starting their lives. Mid-luxury condos in West Los Angeles Area. So as long as the economy keeps growing, we’ll always have young professionals looking for a place to live. I’d be interested to see a research on Real State prices broken down by categories. Affordable Homes, Medium Price Homes and Luxury Homes. Actually the Yahoo data shows year over year monthly percent change not absolute price level. Prices haven’t decreased by 50% in Phoenix and Las Vegas; the chart simply shows that the prices were rocketing along @ around 50% annual growth rate back in ’05 – ’06, but now they’re flat or declining moderately. These areas haven’t seen a wholesale collapse in prices. They’ve seen flattening to mild declines…although the worst may still be ahead of us, so stay tuned. Across the board isn’t is a bad market for speculators, but in some areas investors might start seeing some deals pop up. In my view markets like the Bay Area, Las Vegas, and most of Florida are still wildly overvalued, but in some undervalued markets you can find long term buy-and-hold investments. A property that generates enough cashflow to cover expenses is a good hedge against falling prices – you hope for a soft landing (or even a bounce) but an investor who is cashflow neutral or positive can weather the storm case of a price downturn until the market looks rosier. Christopher, yes I stand corrected. I’ll make the appropriate clarifications shortly. I need to interpret those charts more closely. You’re referring to a decline in growth — in that case, I still would’ve made good money on such ventures. Ah I’m back to regretting things once more! Yeah you’d be ahead if you’d bought in 2000 (well before the takeoff was evident) but you can’t hindsight trade these things, in my opinion. Otherwise you’d be kicking yourself for not cashing in your life savings back in ’04 to invest in the Google IPO — you’d be rolling in it now. But who knew? But at least you’re not one of the guys who bought Vegas/Phoenix/FL investment properties in ’06 just before the roller coaster ground to a standstill. They’re stuck w/ $3,000/month interest only mortgages on properties that are bringing in $2,500/month in rent (before expenses) and they can’t refinance or sell. So if you’re gonna regret not being Guy #1 then be happy you’re not Guy #2! And clarification in my comment above I meant to say that it is a bad market for speculators across the board right now. Fat finger syndrome. You are quite right, everything is in hindsight. Your comments on buying in Vegas/Phoenix/FL late in the game reminded me of Casey Serin’s story. His is not a pleasant place to be! I would love to be a buyer in today’s market. Even though we bought in 2003, I feel like we are ok. We don’t plan to move in the next 10 years. That’s great SS, I don’t plan to ever sell my house. That means if I were to move to a different home, I’m renting this one out. I have too much sentimental value built into my house today. Much has happened here! Bought it in late 2001. I’m thinking about downsizing and I’m not sure what to expect when it comes to financing. I would of course buy/finance the new home first and then put my current home on the market. I just hope I can get out of it what I put into it. It is good if there an improvement in the real estate sector. For one this has a multiplier effect. Like the auto sector, the real estate sector carries different industries. Oh, to have sold up in 2006 and be a buyer now!